Lisa Page’s testimony stated that the Department of Justice prevented the FBI from charging Hillary Clinton for mishandling classified information. That may or may not have something to do with a meeting on an airport tarmac, but that is the situation. Let’s take a trip back in time to reexamine the entire picture. If the FBI had indicted Hillary Clinton for mishandling classified information during the political campaign, Bernie Sanders would have been the candidate and Donald Trump would probably have won. The Democrats would have been up in arms that Donald Trump won unfairly. They are claiming that anyway, but not too many people believe them! Since the Democrats expected Hillary Clinton would win, they assumed the story of the private server would disappear as soon as she took office. Well she lost, and the story is back. But let’s take a look at the consequences of the server. A new report shows that the Chinese hacked Hillary’s homebrew communication server and reports indicate the Chinese killed 12 CIA sources while the server was at her residence. In other words, an American secretary of state who felt entitled to work on her own amateurish computer system had exposed all of her correspondence to one of the country’s most powerful and dangerous rivals in world affairs. And it’s very possible that at least 12 operatives serving United States intelligence agencies paid for Clinton’s security breach with their lives. Maybe it’s a coincidence, but 2010 was Clinton’s first full year as secretary of state. So what do we do with Hillary Clinton? If she were anyone but Hillary Clinton, she would be sitting in jail somewhere. However, if she is charged under a Republican administration, the Democrats will cry that the charges are political. But if she is not charged with the mishandling of classified information, it will be political. How in the world do you solve the accountability problem and the political problem? Today Representative Doug Collins, a Georgia Republican, released 370 pages of Lisa Page’s testimony to a joint congressional task force investigating potential bias in the Justice Department. The Washington Examiner posted an article today revealing some of the details of the testimony. Page said Comey and the FBI spoke with DOJ about a gross negligence charge for Clinton multiple times, but that the DOJ consistently pushed back on it. “We had multiple conversations with the Justice Department about bringing a gross negligence charge. And that’s, as I said, the advice that we got from the Department was that they did not think — that it was constitutionally vague and not sustainable,” she said. Ratcliffe asked if the decision not to charge Clinton with gross negligence was a direct order from the DOJ. “When you say advice you got from the Department, you’re making it sound like it was the Department that told you: ‘You’re not going to charge gross negligence because we’re the prosecutors and we’re telling you we’re not going to,’” he said. Page is the former FBI lawyer who reportedly carried out an affair with FBI agent Peter Strzok, the lead investigator in the Clinton investigation. The thousands of text messages that they sent back and forth about the Clinton and Trump-Russia investigations raised questions of bias, and Mueller eventually removed Strzok from the special counsel investigation. Strzok was also fired by the FBI. Page’s testimony raises further questions related to the decision not to charge Clinton with any crimes, including gross negligence, following a lengthy FBI investigation into her email practices that potentially put classified information at risk. After the revelation that then-Attorney General Loretta Lynch met with former President Bill Clinton on a Phoenix tarmac in June 2016, while Hillary Clinton was running for president, Lynch refused to recuse herself from the case while also saying she would accept Comey’s decision on what charges to bring against Clinton. But Page’s testimony indicates that DOJ had shut the door on gross negligence. The decision on to charge Secretary Clinton was a glaring example of unequal justice. Some of our military have spent time in jail for far less serious offenses. There is also the matter of destroying evidence and deleting subpoenaed documents. As more testimonies are made public, I wonder if it will change the public perception of the abuses of power that were going on in the final days of the Obama administration. The Gateway Pundit posted a revealing timeline today showing that the deep state plan to undercut the presidency of President Trump was formulated about the time President Trump won the Republican nomination. This timeline illustrates the use of government agencies to prevent Donald Trump’s election to the presidency (obviously they failed at that) and if that failed, either drive him from office or discredit him to the point where he couldn’t get anything done. Regardless of which side of the political spectrum you sit on, the idea of using government agencies (non-elected officials) to undermine elected officials should be disturbing to you. Please follow the link above to the article to read the entire timeline. Now through a review of information from April, 2016, related to the corrupt Obama Administration’s fake Trump – Russia collusion farce, we see that this was the exact same time that the fake Trump-Russia collusion story was created. 2016-04-15 It’s reported that Victoria Nuland and other State Department officials became “more alarmed” about what the Russians were up to in the spring of 2016, they were authorized by then Secretary of State John Kerry to develop proposals for ways to deter the Russians. [source] Nuland stated that she had been briefed as early as December 2015 about the hacking of the DNC, long before senior DNC officials were aware of it. By the end of April, 2016, the Deep State of Obama, Comey, Brennan, Kerry and others had already put in place spies on Trump team members, and allegations of a made up company, DCLeaks, that allegedly hacked DNC emails. They also began their sinister Trump – Russia collusion fairy tale. April 2016 will go down in history as the month that a sitting President (Obama) began his scheme using the intelligence community of the United States to spy on its competing campaign in the US election in an effort to prevent them from winning the 2016 Presidential election. If the people responsible for this misuse of government power are not brought to justice, we can expect to see similar behavior in the future. These actions are not appropriate in a representative democracy–they belong in a banana republic. Rex Tillerson has been fired as Secretary of State. He will be replaced by Mike Pompeo. This is not really news to those who pay close attention. Pat Robertson (who hosts the 700 Club produced by the Christian Broadcasting Network) predicted yesterday that Tillerson would be gone today. Why? Because Trump and Tillerson disagreed on too many major issues–Iran, the Paris climate treaty, and North Korea. Tillerson is not a man who is used to operating under someone else’s leadership when he dioes not agree with that leadership, and Trump is not used to having people undermining his policies when they are supposed to be supporting them. The change is probably good for everyone involved. Mike Pompeo is a good choice to succeed Rex Tillerson. He graduated first in his class at West Point and went on the Harvard to get his law degree. He worked in the business world and served in Congress before becoming head of the CIA. It is believed that his worldview is much more compatible with President Trump than was Tillerson’s. Two qualities of a good executive are the ability to be flexible and the ability to change direction when needed. The current shuffle in the White House is a good example of both. Although I am not sure I agree with exactly how the change was handled, it was a necessary change and needed to be done quickly. Now hopefully the President and at least some of the State Department can move in the same direction. Aren’t We Tired Of These People Yet? On Thursday, Townhall.com posted an article about speaking fees collected by Bill Clinton during the time that Hillary Clinton was Secretary of State. You have to hand it to Bill and Hillary, regardless of what in the world goes on in their marriage, they know how to wash each other’s hands financially. She had amazing profits on cattle futures while he was leading Arkansas, and he had amazing speaking fees while she was Secretary of State. Wow. What an incredible coincidence. This is the chart from the article that tells it all? Note the last sentence before the numbers. Company representatives say the speeches were unrelated to any lobbying efforts. Sure they were. Mr. Clinton also had a large payday from Oracle Corp.: a total of $500,000 for two talks given or approved while Mrs. Clinton was secretary of state. He gave one in October 2012 as the company was urging the State Department to increase the number of skilled-worker visas being issued, lobbying reports show. 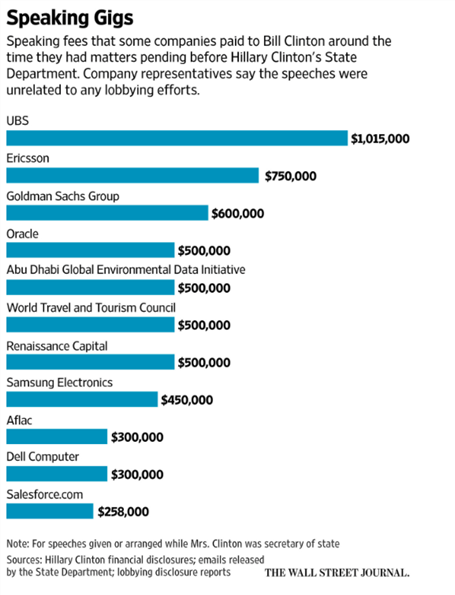 Oracle, Samsung Electronics Co. Ltd. and Microsoft Corp., whose co-founder Bill Gates has suggested eliminating the visa cap altogether, paid Mr. Clinton a total of more than $1.1 million for speeches during Mrs. Clinton’s tenure. Mrs. Clinton has long supported increasing skilled-worker visas, known as H-1B visas, as did her husband when he was president. The issue has remained mired in the broader congressional debate about immigration. In 2009, the Biotechnology Industry Organization lobbied the State Department to get diplomats to oppose rules against genetically modified foods. In December, Mrs. Clinton sent a cable to diplomats telling them to “pay particular attention” to countries considering biotech regulation and to push an “active biotech agenda” that would “protect the interests of U.S. farmers and exporters,” according to a copy released by WikiLeaks. Five months later, the biotechnology group paid Mr. Clinton $175,000 to appear at its convention. After Mrs. Clinton left the State Department, she also spoke at the trade group’s convention, earning $335,000. Seriously, haven’t we had enough of Clinton scandals? Do we really want to go through this with a President Clinton again? Gaps In The E-mails–Say It Isn’t So! Yahoo News posted a story today about gaps in the emails Hillary Clinton provided to the congressional committee investigating the 2012 attack on a U.S. consulate in Benghazi, Libya. Republican Representative Trey Gowdy said his committee lacked documentation from Clinton’s trip to Libya after the attack despite a popular photo image of her using a handheld device during a flight to that country. The article reports that Hillary Clinton has asked the State Department to release her emails, but it does not explain why Mrs. Clinton does not simply release them herself. The investigation into the attack in Benghazi is what shed light on the problem of the unofficial emails, but I believe the controversy over the gaps in the emails regarding Benghazi is misleading. As I reported last Thursday (rightwinggranny.com), Judicial Watch has filed a Freedom of Information Act (FOIA) request seeking any and all communications – including emails – from then-Secretary of State Hillary Clinton and her Chief of Staff Huma Abedin with Nagla Mahmoud, wife of ousted Egyptian president Mohammad Morsi, from January 21, 2009 to January 31, 2013 (Judicial Watch v. U.S. Department of State (No. 1:15-cv-00321)). This latest lawsuit will require the State Department to answer questions about and conduct thorough searches of Hillary Clinton’s newly discovered hidden email accounts. Judicial Watch also has nearly a dozen other active FOIA lawsuits that may require the State Department to search these email accounts. Huma Abedin is also alleged to have a secret account as well. Secret email accounts are unacceptable–even for the Clintons. The law needs to apply to the Clintons as well as everyone else. It is ironic that Hillary Clinton as Secretary of State fired United States ambassador to Kenya Scott Gration for using a private email account.